Standing together, waiting for their picture to be snapped, are two boys wearing gleaming gold medals indicating their spectacular achievement. These aren’t the type of medals given to all participants. These are winners’ medals. They’re evidence of conquered fears, adversities overcome, and races won fair and square. 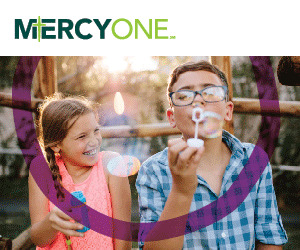 Like most children, they would rather be outside – playing with friends, making something out of sand and mud, catching bugs, or in this case, swimming. Brooklyn, 11, and Zachary, 13, used to be fish out of water when it came to swimming in the deep end of the pool. Zachary wouldn’t let the water get up to his shoulders and Brooklyn refused to dive into the deep end of certain pools. Then they met Michelle, the adaptive aquatics trainer at Waukee’s YMCA and a lifelong swimmer with 25 years of coaching experience. Brooklyn, with his sporty tennis shoes and athletic wear, was born with a lesion on the left side of his brain that makes his right upper body extremely weak. Epilepsy comes paired with the lesion. Zachary, with his sweet smile, has extremely low muscle tone as a result of living with Prader-Willi Syndrome. Both boys were in need of a unique aquatics program for therapeutic, health, wellness and youth development reasons. A little over three years ago, Michelle was in the beginning stages of organizing an adaptive aquatics program with Brian Longren, the aquatics program director at Waukee’s YMCA. It was at this time that Zachary’s mother, Edie, was looking for an alternative to group swimming lessons for her son. Brooklyn had also tried group lessons but they hadn’t worked well for his swimming development. “Swimming with Michelle and experiencing the competition have helped Brooklyn take risks, improve his confidence and know that even though he has his differences, he is able to do amazing things,” said Brooklyn’s dad, Brandon. The physical and cardiovascular exercise is also beneficial for the boys. 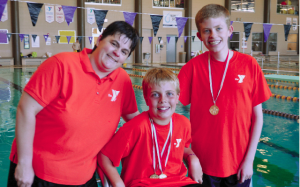 At the Regional Special Olympics Spring Games held at the Indianola YMCA, Brooklyn placed first (and achieved personal bests) in his age division in both of his races – 25-yard freestyle and 25-yard backstroke. He advanced to the state competition where he again placed first and recorded personal bests in both events. “I get nervous before a race, but when I win, it feels awesome,” said Brooklyn. Zachary won the 25-yard backstroke in his age division at the Regional Special Olympics Spring Games. This qualified him to converge with nearly 3,000 other athletes at the Special Olympics State Summer Games in Ames. There, he swam to a first-place finish in his age division as well. Although swimming is an individual sport, Michelle added that camaraderie is another benefit of swimming, noting that YMCA programs encourage teamwork and cheering for one another. “Friendships are built here,” she said. Next April at the regional Special Olympics meet in Indianola, look for the boys who are doing their best, competing with the rest – for it’s in these moments that their confidence grows bigger than all of the obstacles placed in front of them.